Those guys down at United Parcel Service are a bunch of trouble-making tattle-tales. Apparently, every time I order something online, they send MY HUSBAND an email notification. Not me, mind you, my husband. Seriously UPS? Why do you do this? I assure you, there’s no need to involve him. I am a full grown woman. I literally own 1/2 of this house you’re delivering to. A whole 1/2! Citibank Visa obviously approved the purchase; all you have to do is deliver the package. What’s more, have you dudes ever heard of a little blip in our nation’s history called THE WOMAN’S MOVEMENT ? As long as we’re Tossing notifications around, here’s a little notification from me for You: Women IN THE UNITED STATES can order crap these days without permission from our husbands. Why can’t y’all just drop my packages off on my porch discreetly, like those cool guys at Fed Ex do, without causing a ruckus in my marriage? 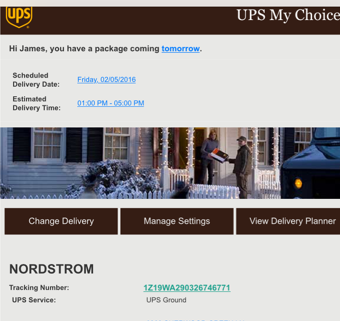 …Jimmy thinks that the Nordstrom link that was embedded in the UPS notification was a picture of the goodies that I ordered last week, bless his heart. He doesn’t understand the sophisticated, opportunistic world of online marketing. (What I actually ordered last week were some cute white jeans for an upcoming trip – Valentine’s Day Fashions are never High Priority Status) The savvy marketing gurus down at Nordstrom simply added the link to the UPS DELIVERY NOTIFICATION reasoning that any customer who would order a pair of white Ankle-zips would probably want a red Valentines Day teddy! It was all a simple misunderstanding caused by UPS and their commitment to meddling. You got his hopes up for absolutely no good reason. And, once again, you make me look like the Bad Guy. I’m sure you think it’s cool that you “have his back” when you email him every time I make an online purchase, but he’s not your “bro,” your “buddy,” or your long lost fraternity brother. He wasn’t even in a fraternity in college, but if he had been, he’d have been a Fed Ex, not a UPS. They are so much cooler.